These five foods were once listed as toxic to cats. They are showing up more often on pet food labels. Does your pet consume them? 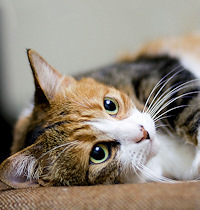 New information explains why some of the most nutritionally beneficial food ingredients for a cat’s biology were previously left out of their diets. Alfalfa sprouts were once listed by the ASPCA as plant matter considered toxic to cats. Consumption of alfalfa sprouts by cats is in fact, not toxic. Alfalfa is one of nature’s most nutrient-rich foods. It is an excellent source of Protein, Vitamin A, Niacin and Calcium, and a very good source of Dietary Fiber, Vitamin C, Vitamin K, Thiamin, Riboflavin, Folate, Pantothenic Acid, Iron, Magnesium, Phosphorus, Zinc, Copper and Manganese. The concern for alfalfa toxicity comes from the potential of the plant to be contaminated with a mold fungus named aflatoxin. Because humans are extremely sensitive to aflatoxin poisoning, the food chain in the U.S. heavily monitors and tests for the presence of aflatoxin when sprouts are processed and distributed for both human and animal consumption. Alfalfa meal (dehydrated leaf and flowers) is used as a natural ingredient in some cat foods. Once listed as highly toxic for cats to consume, it is now much better understood that only parts of an avocado (and arguably only specific species’ of avocados) can be dangerous to cats. The seed/pit, skin/bark and leaves have proven to be the culprit for ails to a cat who has ingested any of those parts. The tender fruit-meat is safe. Avocado is used in cat foods for its excellent ability to naturally provide necessary Omega-6 and Omega-3 fatty acids and Choline of the B-vitamin complex. The “good fat” and oil of the avocado is also valued to aid cats with skin and coat health as well as for hairball control. One of the most nutrient-rich foods available and beneficial to cats is misunderstood as toxic because it requires conscientious preparation before being served. Eggs are not toxic to cats. Except for the egg white (albumen) which a cat should avoid consuming, all other parts of the egg (yolk, shell and membrane) are a superior source of vitamins and minerals. Raw egg yolk is a good source of Protein, Folate, Vitamin B12, Calcium, Phosphorus, and is a very good source of Selenium, Omega-6 and Omega-3 fatty acids. Egg shell meal and/or egg yolk powder are used as natural ingredients in cat foods. Egg whites contain a protein named avidin which interferes with the absorption of biotin. Biotin is necessary for cell growth, production of fatty acids, and metabolism of fats and amino acids; all very important processes for feline physiology to be able to complete, thus avoid serving egg whites to cats. The likeliness of a cat in the United States possibly contracting salmonella from raw egg consumption can be set aside for the most part. Different from humans, cats naturally have resistance to the bacteria. Their short digestive tract and highly acidic digestive acids also help to inhibit the bacteria’s proliferation. A study by the U.S. Department of Agriculture in 2002 (Risk Analysis April 2002 22(2):203-18; suggests only one in every 30,000 eggs is infected of 69 billion eggs farmed annually. Another misunderstood consumable is garlic. It is added to some cat food brands in very small amounts in powdered form. As a pet food ingredient it is valued as a powerful antioxidant, as well as it has anti-viral, anti-fungal, anti-inflammatory and immune-boosting properties. It is an excellent source of manganese for bone health and vitamin B-6 for enzyme metabolism. It is also a surprisingly good source of calcium and phosphorous which are important for balancing pH for urinary tract health. Although a very small amount of garlic is not harmful for cats to consume; because of its potent medicinal blood-thinning attribute, if ingested in greater dosage than recommended can cause Heinz body anemia in cats. It is not recommended to offer garlic in addition to what is already supplemented in their food without medical advice or supervision. Garlic oil is product in its most potent and concentrated form and should be avoided. Not all tomatoes are toxic to cats. Ripe tomatoes are not poisonous or toxic, however, green tomatoes can be. Green/unripe tomatoes and their greens (leaf and vine) contain an alkaloid called Glycoalkaloid Solanine, considered harmful to felines. Powdered tomato is often used as a natural ingredient in pet foods for its nutrient content and comes from ripe tomatoes. It is valued as a source for Vitamin K, Thiamin, Riboflavin, Niacin, Pantothenic Acid, Magnesium and Potassium, and is a very good source of Protein, Amino Acids, Dietary Fiber, Lutein, Lycopene, Vitamin A, Vitamin C, Vitamin E (Alpha Tocopherol), Copper and Manganese. A wealth of benefits comes with the information available about how a cat metabolizes what is in these foods. This knowledge allows for pet food companies to formulate products that are much easier for a cat to digest. Natural ingredients are loaded with vitamins a cat’s body can absorb and use more efficiently. It also reduces the amount of synthetic vitamins used for supplementation. Many of the better brand foods use very little supplement, if any at all. How many of these items are in your feline’s favorite dinner entree?